As I am sure many offices across the nation did, ours adopted several families for the Christmas season and we had an angel tree for them with ornaments of their Christmas needs. 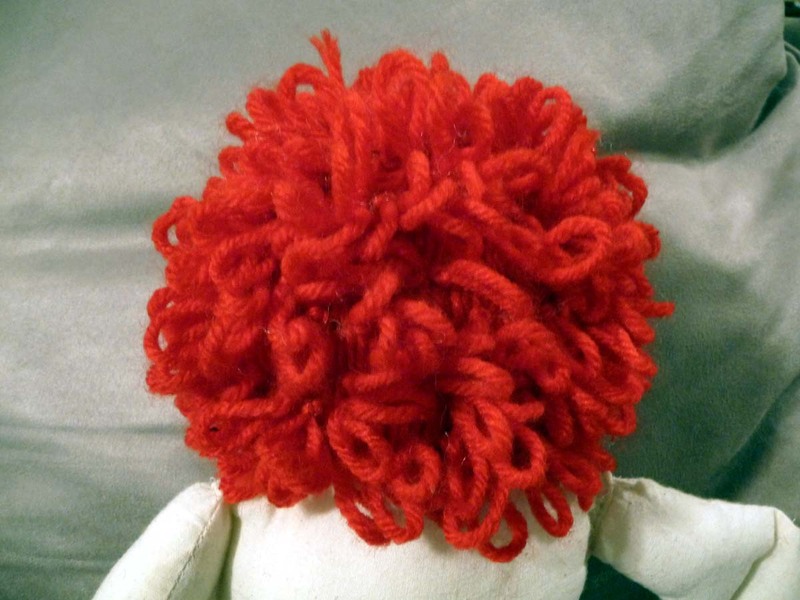 After perusing the many options available I decided to do a doll for a three year old girl. I knew I wouldn’t be able to spend a lot but I thought I’d be able to find something. 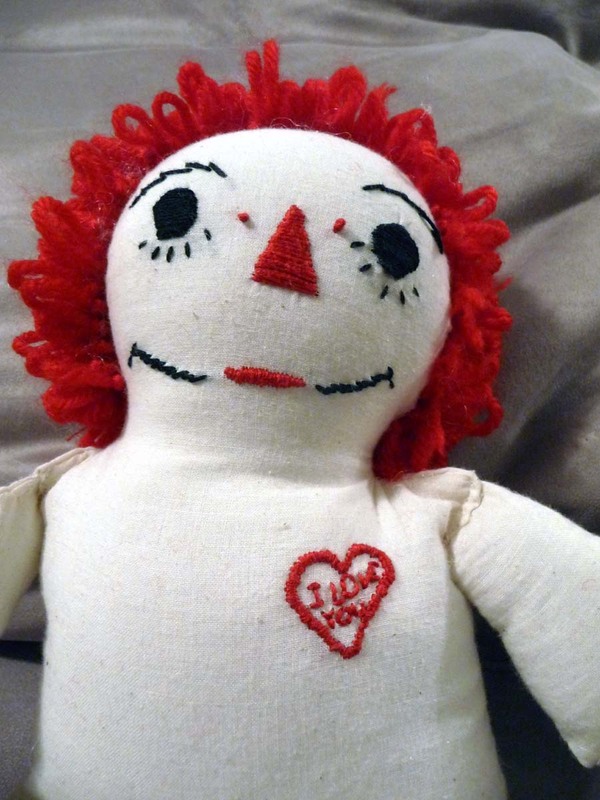 Yes, there were dolls that were marked 3 & up when I checked on my next shopping trip, but nothing that I was willing to purchase in my price range. 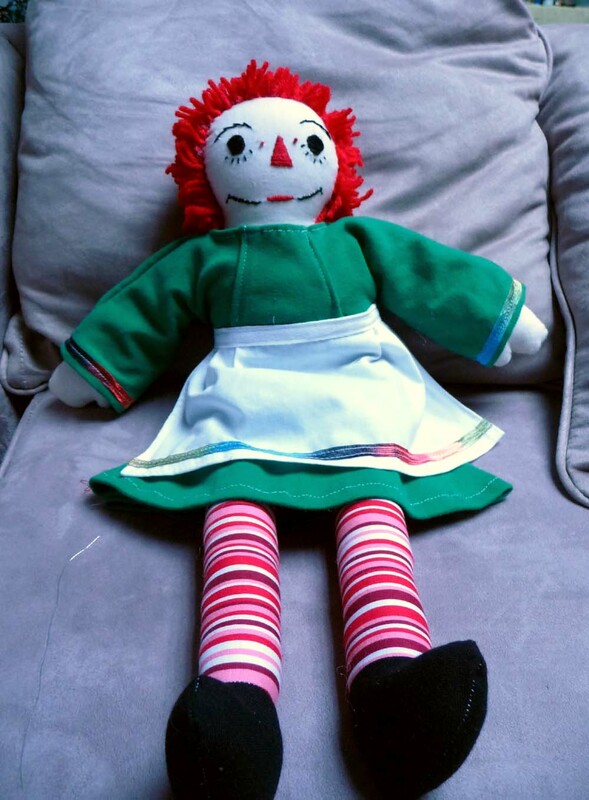 This led to Plan B aka Alaina’s craziest holiday decision of the year – make the doll. 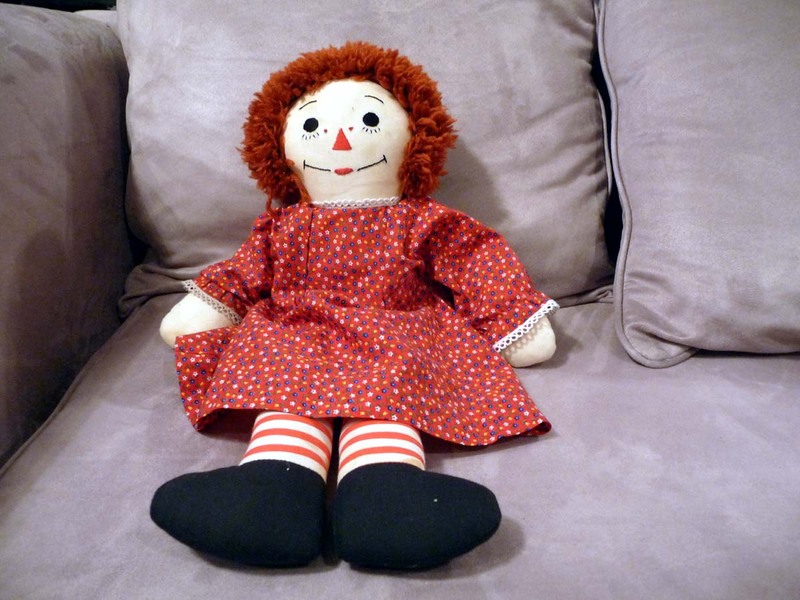 I will admit this decision and project were largely inspired by the Raggedy Ann doll that I myself received from my grandmother as a girl. See how cute and well-loved she is? That in mind I picked up some unbleached muslin on my next rip to JoAnn’s (the most dangerous store in a 30 mile radius) and promptly got absorbed in other things – like NaNoWriMo & putting together a rockstar poster for our lia sophia party. Suddenly gifts were due in five days and I realized I had not only not started, but was missing supplies. Three more days passed and it was Monday night. NaNo was 95% done. The poster had been a success. I finally made an emergency walk to JoAnn’s for striped fabric & embroidery floss. 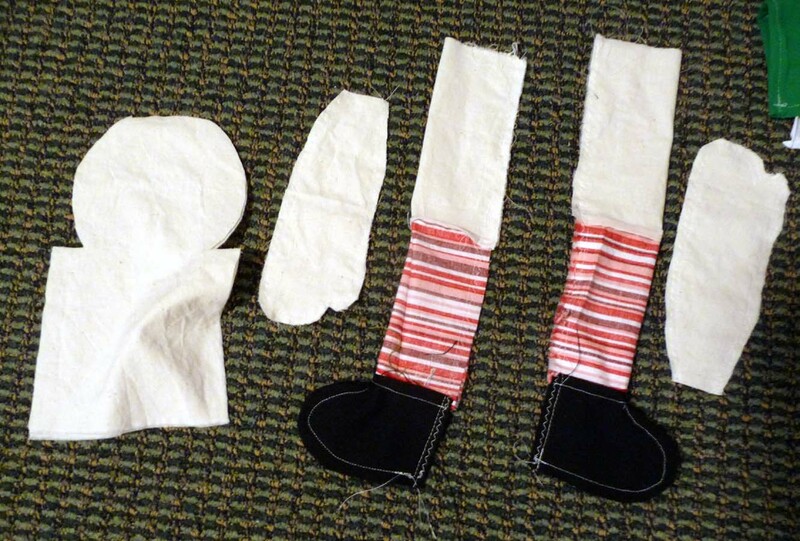 After washing all of my fabric (so it would do any shrinking before the sewing) I began to cut and piece together the beginnings of a doll. I realized retrospectively that I should have been more careful in lining up those stripes because they were just bit off, but that realization came much later in the process. I also started on her attire. 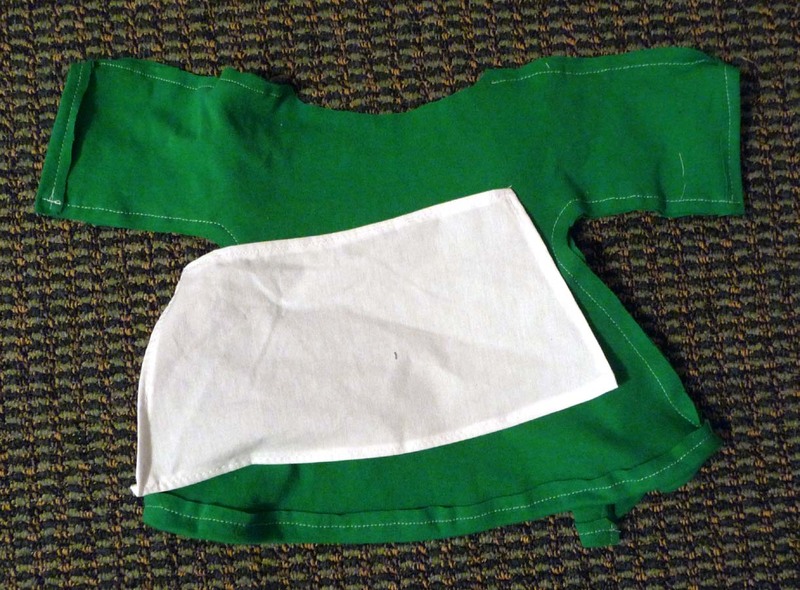 There were several different fabrics I was looking between for her dress before settling on this kelly green cotton jersey because it went best with the bright stripes in her stockings. 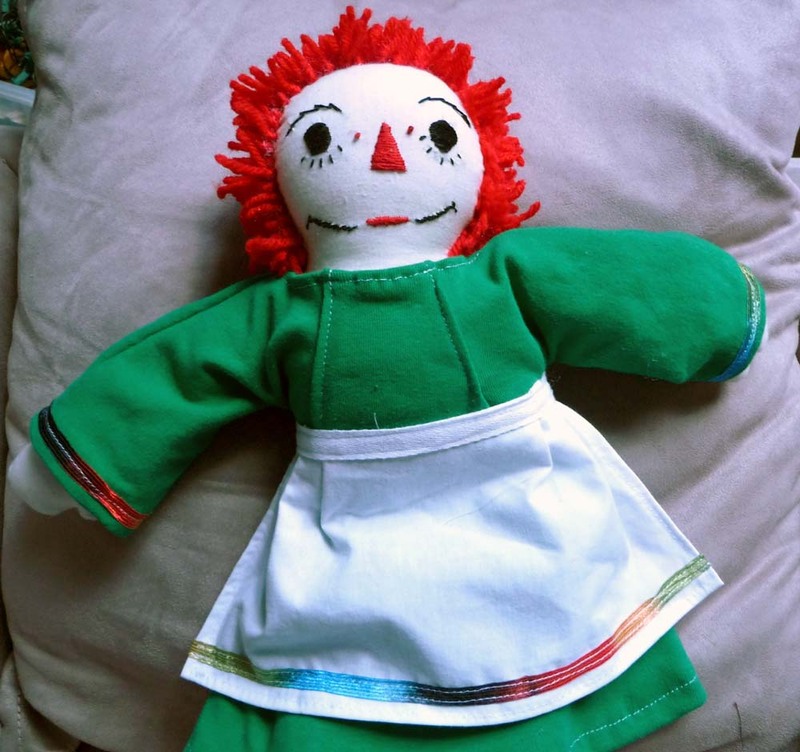 Traditionally, Raggedy Ann is in blue but none of the blues I had looked quite right and another run to the store was out of the question at this point. Tuesday I knew I would have some work ahead of me with the embroidery on her face and chest. It really wasn’t that bad and I was quite pleased with how it turned out. What I was not expecting was how fricking (or should I say frakkin?) long it took me to do her hair. That there is at least half of Return of the Jedi as well as the majority of Iron Man. Why? Check out the close up. 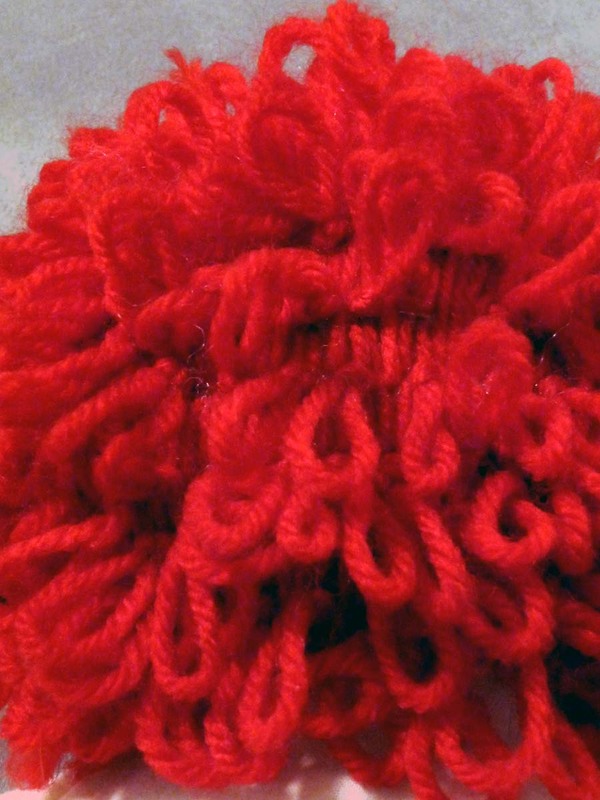 Every single one of those loops was hand pulled and knotted. If only I had realized what a process it was I would have attempted to spread that out over several sittings instead of one. I will say I am much better at it now than when I started. By the time I was done it was the wee hours of the next morning, so I called it a night. Her body and attire were almost complete. Wednesday was when gifts were due so I ran home over a late lunch and finished up the details like cutting the loops on her hair and edging her sleeves and apron. I also solved my biggest conundrum of the process – how to close her dress. Being for a three year old, snaps and buttons were a no and ties probably beyond her skills. I don’t much care for velcro so I was a bit stuck. Then I found the random zipper that was exactly the length I needed. I;m not even sure where it came from, so I’m going with that it was meant to be. Once that was in she was complete. She paused for a picture before being packed up and wrapped. 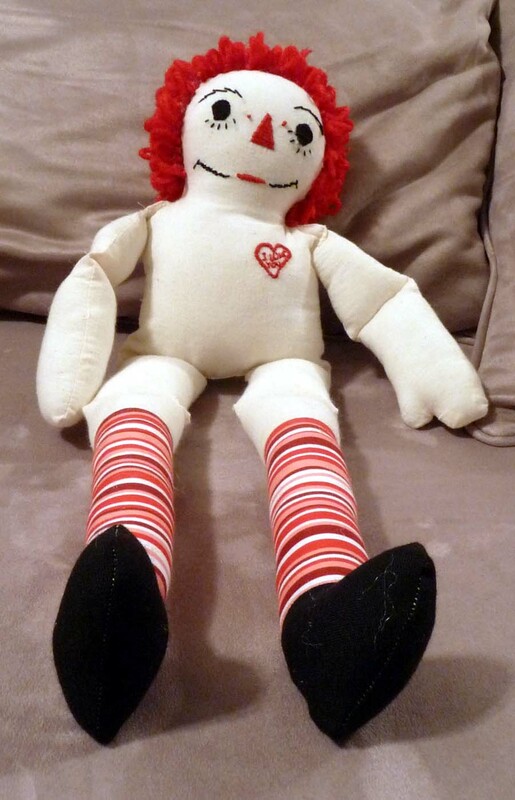 Sometime this coming week she will arrive with her new family and be opened by a little girl who I sincerely hope will enjoy and find companionship in her just as I did in the Raggedy Ann I received. Aside from being nervous that she is not at all what her new friend is wanting, I am quite pleased with how she turned out. I won’t say that I’ll never do it again because I am sure I will, but I certainly will have a much better idea of what I am doing when the time comes. P.S. This is also why there haven’t been any further posts from me this week. I do have a few in the wings waiting for final finishing touches that will be up sometime this weekend.